Photograph © Eric Meola. Prismatic light in glass. Las Vegas, Nevada, USA. The famous and well-known photographer presented today is Eric Meola, whose photography and articles I have discovered a while ago on The Luminous Landscape. By this, I have already admitted my photography illiteracy, because I had not known Eric Meola for his iconic advertisement shots, travel photographs, or portraits of Bruce Springsteen (also look HERE), but only discovered and became interested in his more recent, abstract photographs. The colorful and abstract photographs of Eric Meola, are more about seeing and discovering compositions everywhere than about documenting iconic landmarks. The capture shown above, Prismatic light in glass, is a wonderful example. 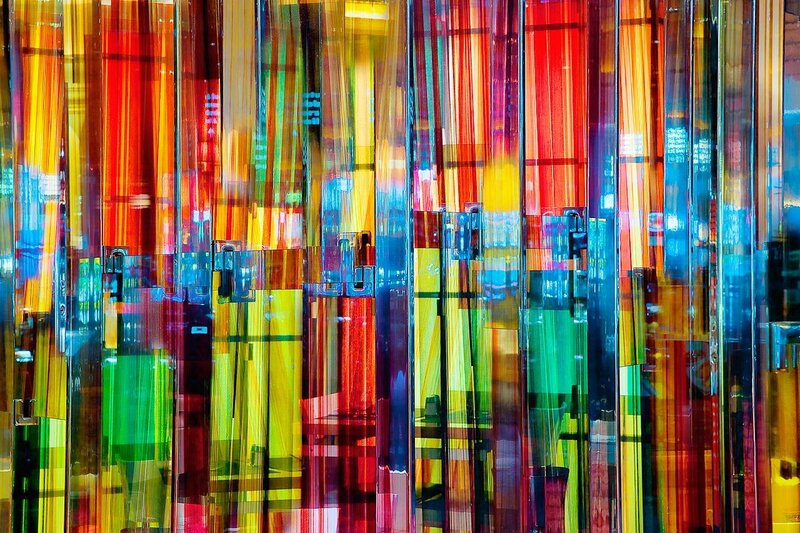 The subject of this photograph is "just" a glass wall in a Las Vegas restaurant that was transformed into this amazing color palette by reflections. If you look carefully, I think one can recognize parts of a table and chairs, but other than that there is not much hint of the location. Make sure to listen to the audio commentary accompanying this composition. Eric Meola tells the "behind the scenes" of this flashy and wild reflection photograph and you can even learn a thing or two about chromatic adaptation and how we see color under different conditions. In addition to the strong colors and contrasts in the photograph above and in Eric Meola's photographs in general, I particularly like the way he composes, which I think is quite distinct. Instead of capturing scenes that contain interesting details, he zooms in on the detail that caught his interest. As a viewer, I know immediately what he discovered and wanted to show. The results are carefully composed, straightforward photographs with strong contrasts and colors and without superfluous elements. The tight composition detaches the subject from its surrounding and by this often renders ordinary subjects abstract. For a long time I have disliked the keyword "abstract" to describe photographs, because, in my opinion, a photograph cannot show something which is truly abstract. However, after reading articles and interviews by Eric Meola, I have changed my mind (I recommend reading The black wall, for example). Photographs can very well be abstract in the sense that they do not aim at documenting an actual subject, but rather show an ephemeral quality - for example color under a particular condition, light and shadow patterns, or a tiny detail of a larger whole. It may be compared to a writer who describes a particular character trait of a person independent of what that person looks like. In this sense, abstract photographs record character traits of a subject rather than its looks. There is a plethora of interesting and educative texts by and about Eric Meola. Besides his homepage, including the audio commentaries to several other photographs, I particularly like his articles on The Luminous Landscape. I always find his explanations rich in content and full of insight and at the same time lacking any kind of dogmatism or boasting. They have a quality of humbleness, which I appreciate. His Legends Online site is very informative with short texts to many of his iconic photographs, Syracuse University, where he studied, has a long text about Eric Meola, there is of course also a wikipedia article, as well as many interviews such as the one by Chris Maher and Larry Berman, John Paul Caponigro, or FuseVisual. This is only a small collection of links; if you are interested many more websites and even books wait to be discovered.